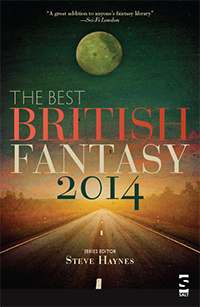 This entry was posted in Reviews and tagged Best British Fantasy 2014, Carole Johnston, David Turnbull, Georgina Bruce, Guy Haley, Helen Jackson, Jess Hyslop, Steve Haynes, Tom Maughan. Bookmark the permalink. You’ve picked and analysed some corkers from this collection; so tempted even though I’m eschewing book-buying till I’ve read more of the ones I’ve got.